How Many Cigarellos do I need? How Many Chocolate Cigarellos do I need? This guide is based on using 3 cigarellos per inch - this is closely spaced, almost touching. For unusual shapes not shown on the chart below, you can use a piece of string or ribbon to measure the distance round your cake, then use the 3 per inch rule to estimate quantities. Our Belgian Chocolate Cigarellos are the particularly fine, high quality ones made by Unifine, not the very fragile 'budget' versions which are also now on the market. 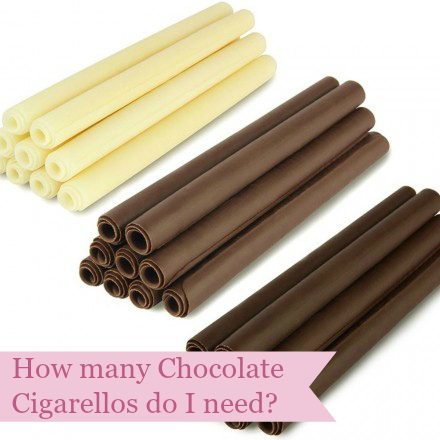 Easy to use, these ready made cigarellos mean that you can fairly quickly produce a stunning chocolate centrepiece. The cigarellos are approximately 10cm (4 inches) high, and one 700g box contain approx 140 cigarellos. Use the table below to work out how many you will need, then you can calculate how many boxes to order! Allow some extra in case of breakages. Why not use our chocolate filling cream to coat your cake and attach the chocolate cigarellos for best results?